Discussion in 'Current Events' started by MMC, Feb 13, 2019. The Senate will hold a vote on the Green New Deal, an environmental and energy plan touted by progressives, Senate Majority Leader Mitch McConnell (R-Ky.) said on Tuesday. 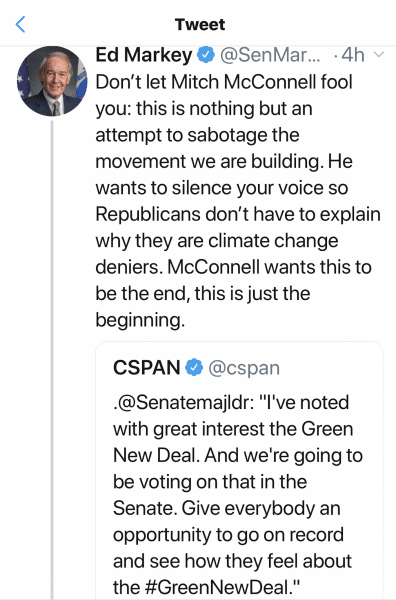 Ahahahahaha…..McConnell is setting up the Demos to see who will support it on record. Getting them on record so they can't just say whatever. This is a smart move by McConnell. Not only does it get the Demos on Record. But he also gets those Demos running for the Presidency on record. Now lets see if Kamala, Warren, Sparticus Booker and others give that full throated support. What say ye? Talon, Ddyad, Hotdogr and 2 others like this. Sparticus Booker is all in for AOC's Green Deal.....he will be one of the first to fall out of that Demo Clown Car. McConnell knows this will help Trump and Repubs for 2020. As you can see our resident leftness doesn't like how McConnell just set up the Demos to look really bad in front of the country. As we can see?? Can you explain that?? Love how the dems/MSM are just pretending the FAQ released by AOC didn't happen. I agree with McConnell, force a vote and lets see who supports it. Pollycy, Talon, headhawg7 and 2 others like this. So what if Dems support it, Repubs control the Senate and will vote it down. How is this different than Repubs not voting for Obamacare. FreshAir and Gorgeous George like this. So you feel that the Green New Deal is a good idea and would be good for our country? This Green New Deal will be a hot button issue during the next presidential election. It will be good to know who really supports it vs. people just flapping their lips, which is what most in DC like to do. Blaster3 and MMC like this. 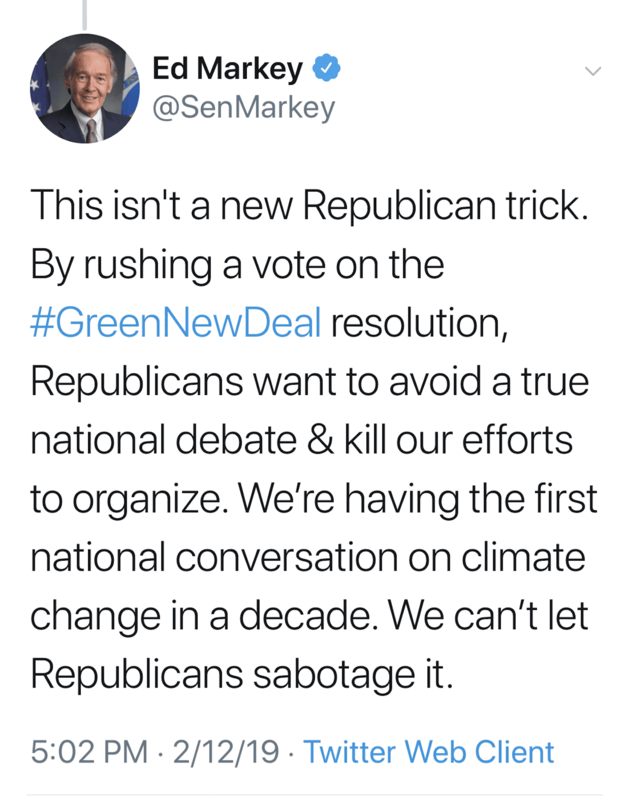 It’s not because he thinks the Green New Deal is a good idea. After the Senate majority leader announced that he would let allow a vote on the plan by Democratic senators and congresspeople, many questioned McConnell's decision. The Green New Deal, which proposes sweeping changes to US policy, has not been through the legislative process. McConnell wanted to put senators "on record," he said on Tuesday, but offered no further details. Did you need to see Right leaning sources since you doubt your leftists sources? Oh is that equivalent to how McConnell said he was going to get those Judges confirmed. Get back to us when you finally come into contact with reality. Yeah I've heard that expression (talking point) used on the tube a few times to mollify how nuts it is. Any honest appraisal of what is proposed however should find the Green New Deal completely insane. It would destroy our nation if implemented. Looks like environmentalists have looked into it. Of course leftists will now be forced to dump on their own. Won't be able to blame Repubs to much. Blaster3, drluggit and glitch like this. Let us know when an actual debate and vote is scheduled... thanks! How is voting different from nonvoting? To ask the question is to answer it. Dutch, headhawg7 and glitch like this. No worries....I like mocking leftists. Especially after Mike Allen's Vox makes the cult following look bad. The democrats that think you can flip an island over by putting 5000 people on it will also believe you can build trains across the ocean and eliminate air travel. Democrats who elect these people and believe what they say are a huge joke to the rest of the country. AOC is like the Democrats sarah Palin, but only half as smart. Louisiana75, headhawg7 and Revax like this. Needs all the publicity that can be put on it. Cheaper than hiring a PR firm. He doesn't know that the Co founder of Greenpeace has put him and his kind on full display. In his defense.....afterall he is a Democrat. Blaster3, drluggit and Zorro like this. Take the club to the Piper Cub! And justice for the unwilling to work. Tooti-fruit. Why sponsor something like this in the Senate, and then scream when it gets a floor vote? And why are they so confident in the fact that their constituents won't see through the obvious charade? Cmon now.....AOC was listening to Christopher Cross. Sailing. Sail Away. Zorro and TheGreatSatan like this. Can't hide out in the 30 second soundbite. No protection from their propaganda machine.....the Lame Stream. jay runner and Zorro like this. But they think their constituents are complete idiots the way they assume they will just swallow the crap they spoon feed them. 100 years from now, historians are going to look back at our current Democratic Party and just say “WTF?”. They’ll conclude it was some kind of mass hysteria, like in Salem, Massachusetts circa 1680. Louisiana75, headhawg7, Blaster3 and 1 other person like this.